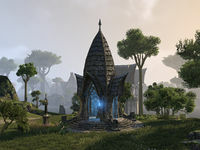 The College of Aldmeri Propriety is a school in northwestern Auridon. It is a Thalmor school intended to teach Bosmer, Khajiit and lower-class Altmer the proper way to behave. Despite what the current headmaster, Tanion, says, there have been many allegations of teachers abusing the students. There are also reports that Tanion has sided with the Veiled Heritance. College of Aldmeri Propriety Objective: Investigate what's happening at the college. Harsh Lesson: Uncover abuse at a renowned school. Final Blows: Destroy the last remnants of the Veiled Heritance. Springtime Flair: Cheer up Auridon's locals on behalf of your "queen". The College Wayshrine is located near the bridge leading to the College. This page was last modified on 30 January 2019, at 21:20.